Immersion Shawl. 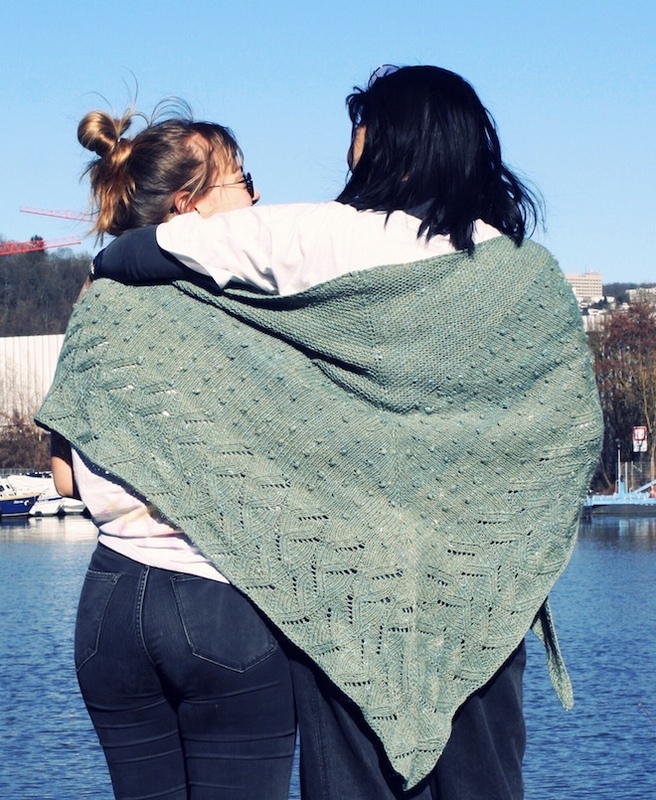 | Wool & Good Co.
My new design Immersion Shawl is inspired by all the yoga practice I did during winter. I wanted a shawl to wrap myself in completely, either at the beginning of the yoga class or during meditation at the end. A cosy, protecting wrap to feel good. The shawl is worked from the top down and with broad, textured blocks. If you like to explore different stitch patterns, here you go. First, there is a block of garter stitches to get in the mood. The next pattern block is stockinette with tiny bobbles. I can’t get enough of knitted bobbles, really. I already used them in my last design (oh, and for the record: they are still in my head for the next one … ). Anyway, Immersion Shawl ends with a large lace border and a few rows of garter stitch. I wanted the shawl huge – so I was looking for a DK yarn that would give a very good drape. The Fibre Co. Acadia is a shiny blend of Merino, alpaca and silk noil. The different fibres react differently in the dye pot, so the yarn has interesting shades and a tiny bit of a tweedy look thanks to the silk. I originally wanted to take the photos in my friends Yoga Studio to match the inspiration for the design. Then, all of a sudden, it was spring and for a non-professional photographer with a basic camera, it is much easier with natural light. So I decided to go to Saarbrücken’s small port and take photos in the sun. 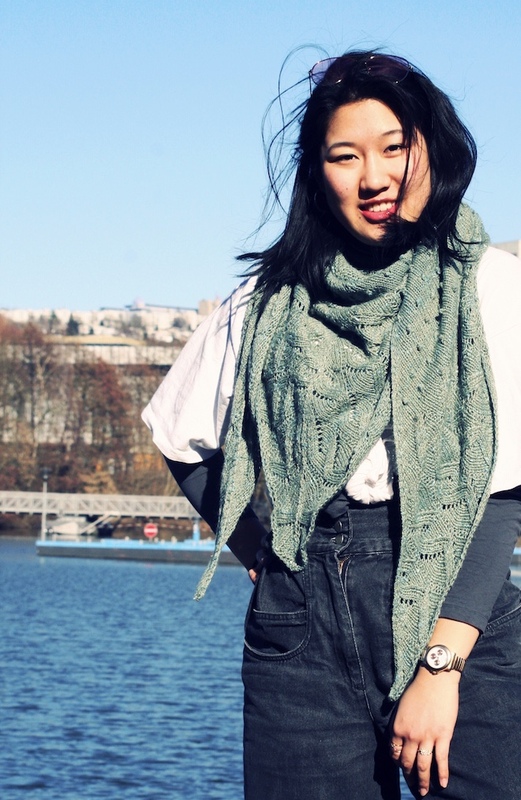 Thank you, Ida and Franzi for letting me take your pictures with my knitwear. You are the best! 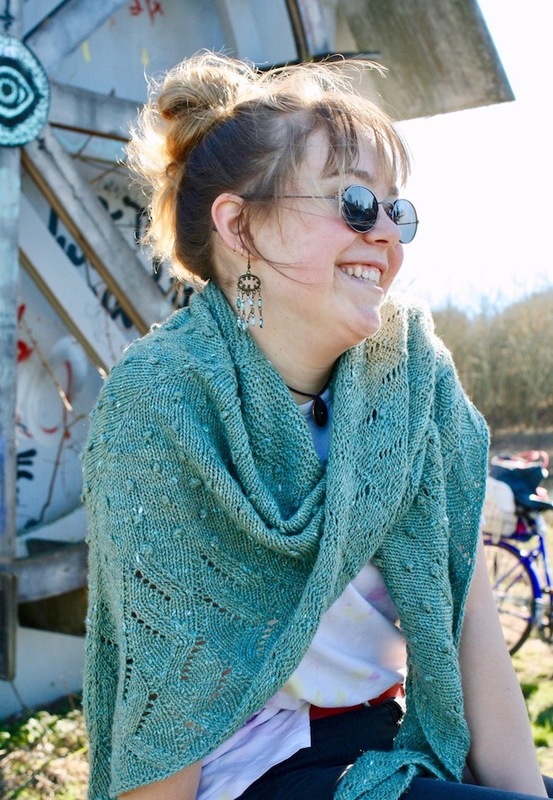 The pattern for your Immersion Shawl can be found in my Ravelry store. Click here for all the missing information (gauge, needles, etc.). And check out the projects of my test knitters, they did a great job with the bobbles (not only).